Bu araştırmada, dışarıdan hidrojen peroksit (H2O2) uygulanarak oluşturulmuş oksidatif stresin ekmeklik buğdayda fide gelişme dönemlerindeki bazı morfo-fizyolojik özelliklere etkisinin belirlenmesi amaçlanmıştır. Araştırmada, 5 ekmeklik buğday çeşidi (Flamura-85, Selimiye, Esperia, Tosunbey ve Sultan-95) ve 3 ileri ekmeklik buğday hattı (TDE-45-1, TDE-84-5, TDE-111-9) materyal olarak kullanılmıştır. Deneme, genotipler ana parselleri, farklı yoğunluktaki (0, 50, 100 mM) H2O2 solüsyonları alt parselleri oluşturacak şekilde tesadüf parsellerinde bölünmüş parseller deneme desenine göre 3 tekrarlamalı olarak kontrollü bitki yetiştirme odasında saksılarda yürütülmüştür. H2O2 uygulama gününü izleyen üçüncü günde bitkilerde kök uzunluğu (cm), sap uzunluğu (cm), klorofil içeriği (SPAD), yaprak su kayıp oranı (%), stoma sayısı (adet), stoma eni ve boyu (µ) incelenmiştir. H2O2 uygulamasıyla oluşturulan oksidatif stres ile kök uzunluğu % 8.60-17.18 oranında, sap uzunluğu % 5.85-11.36 oranında, klorofil içeriği % 6.50-14.98 oranında, stoma eni % 12.00-13.77 oranında ve stoma boyu % 9.78-20.66 oranında önemli bir şekilde azalmıştır. Bununla birlikte, stoma sayısı ve yaprak su kayıp oranı ise sırasıyla % 16.83-21.60 ve % 27.95-46.50 oranında artmıştır. İncelenen özellikler bakımından, Flamura-85 ekmeklik buğday çeşidi ile TDE-45-1 ve TDE-111-9 ileri ekmeklik buğday hatlarının diğer genotiplere göre oksidatif strese yanıtlarının daha iyi olduğu belirlenmiştir. The aim of this research was to determine the effect of oxidative stress derived from exogenous application of hydrogen peroxide (H2O2) onto some morpho-physiological characteristics of some bread wheat entries at seedling stages. In the research, 5 bread wheat cultivars (Flamura-85, Selimiye, Esperia, Tosunbey and Sultan-95) and 3 advanced bread wheat lines (TDE-45-1, TDE-84-5, TDE-111-9) were used as plant material. The experiment was carried out in randomized complete split plot design with 3 replicates in pots in controlled conditions where bread wheat genotypes were placed into main and H2O2 ratios (i.e.0, 50 and 100 µM) as sub plots respectively. Root and shoot length (cm), chlorophyll content (SPAD), the rate of leaf water loss (%), number of stomata (number), stomata width and length (µ) of the plants were recorded on 3rd day after H2O2 application. Root length, shoot length, chlorophyll content, stomata width and stomata length decreased 8.60-17.18 %, 5.85-11.36 %, 6.50-14.98 %, 12.00-13.77 % and 9.78-20.66 %, respectively, with oxidative stress created by H2O2 application. However, number of stomata and the rate of leaf water loss were increased 16.83-21.60% and 27.95-46.50%, respectively. It was concluded that the responses of Flamura-85, TDE-45-1 and TDE-111-9 were better responding entries to H2O2 based oxidative stress than the other genotypes for all traits used in the study. Agostinetto D, Perboni LT, Langaro AC, Gomes J, Fraga DS, Franco JJ 2016. Changes in Photosynthesis and Oxidative Stress in Wheat Plants Submmited to Herbicides Application. Planta Daninha, Viçosa-MG, 34(1):1-9. Allahverdiyev T 2015. Effect of Drought Stress on Some Physiological Traits of Durum (Triticum durum Desf.) and Bread (Triticum aestivum L.) Wheat Genotypes. Journal of Stress Physiology & Biochemistry, 11(1): 30-32. Anonim 2016. FAO Statistical Databases. www.fao.org/site/567/default.aspx. (Erişim tarihi: 15.03.2018). Ashfaque F, Iqbal M, Khan R, Khan NA 2014. Exogenously applied H2O2 promotes proline accumulation, water relations, photosynthetic efficiency and growth of wheat (Triticum aestivum L.) under salt stress. Annual Research and Review in Biology, 4(1): 105-120. Caverzan A, Casassola A, Brammer SP 2016. Antioxidant Responses of Wheat Plants under Stress. Genetics and Molecular Biology, 39(1): 1-6. Chachar MH, Chachar NA, Chachar Q , Mujtaba SM, Chachar S, Chachar Z 2016. Physiological Characterization of Six Wheat Genotypes For Drought Tolerance. International Journal of Research – Granthaalayah, 4(2): 184-196. Clarke JM, McCaig TN 1982. Excised-Leaf Water Retention Capability as An Indicator of Drought Resistance of Triticum Genotypes. Can. J. Plant Sci., 62: 571-578. Dat J, Vandenabeele S, Vranová E, Montagu MV, Inzé D, Breusegem FV 2000. Dual Action of The Active Oxygen Species During Plant Stress Responses. Cellular and Molecular Life Sciences, 57: 779-795. Dillen SY, Marron N, Koch B, Ceulemans R 2008. Genetic Variation of Stomatal Traits and Carbon Isotope Discrimination in Two Hybrid Poplar Families (Populus deltoides 'S9-2' x P. nigra 'Ghoy' and P. deltoides 'S9-2' x P. trichocarpa 'V24'). Ann Bot., 102:399-407. Doheny-Adams T, Hunt L, Franks PJ, Beerling DJ, Gray JE 2012. Genetic Manipulation of Stomatal Density Influences Stomatal Size, Plant Growth and Tolerance to Restricted Water Supply Across a Growth Carbon dioxide Gradient. Phil. Trans Royal Society B-Biological Sciences, 367:547-55. Düzgüneş O, Kesici T, Kavuncu O, Gürbüz F 1987. Araştırma ve Deneme Metodları (Ders Kitabı). Ank. Üniv. Zir. Fak. Yay., No:1021/295, Ankara, 381 s.
Gechev T, Willekens H, Van Montagu M 2003. Different Responses of Tobacco Antioxidant Enzymes to Light and Chilling Stress. J. Plant Physiol., 160: 509-515. Gondim FA, Gomes-Filho E, Lacerda CF, Prisco JT, Neto ADA, Marques EC 2010. Pretreatment with H2O2 in maize seeds: Effects on germination and seedling acclimation to salt stress. Brazilian Society of Plant Physiology, 22 (2): 103-112. Hameed A, Farooq S, Iqbal N, Arshad R 2004. Influence of Exogenous Application of Hydrogen Peroxide on Root and Seedling Growth on Wheat (Triticum aestivum L.). International Journal of Agriculture & Biology, 6(2): 366-369. Hameed A, Malik SA, Iqbal N, Arshad R, Farooq S 2003. Influence of Hydrogen Peroxide on Initial Leaf and Coleoptile Growth in Etiolated Wheat (Triticum aestivum L.) Seedlings. Asian J. Plant Sci., 2(15-16): 1121-1125. Kacar B, Katkat AV, Öztürk Ş 2002. Bitki Fizyolojisi. Uludağ Üniversitesi Güçlendirme Vakfı, Yayın No: 198, VİPAŞ A.Ş. Yayın No: 74, Bursa, 563 s.
Kumar RR, Sharma SK, Gadpayle KA, Singh K, Sivaranjani R, Goswami S, Rai RD 2012. Mechanism of Action of Hydrogen Peroxide in Wheat Thermotolerance - Interaction Between Antioxidant Isoenzymes, Proline and Cell Membrane. Afr. J. Biotechnol., 11(78): 14368-14379. Kumar S, Beena AS, Awana M, Singh A 2017. Physiological, Biochemical, Epigenetic and Molecular Analyses of Wheat (Triticum aestivum) Genotypes with Contrasting Salt Tolerance. Front. Plant Sci., 8:1-20. Kün E 1996. Tahıllar-I (Serin İklim Tahılları). Ankara Üniversitesi Ziraat Fakültesi Yayınları No. 1451, Ders Kitabı No. 431, Ankara, 322s. Lamb C, Dixon RA 1997. The Oxidative Burst in Plant Disease Resistance. Annu. Rev. Plant Physiol. Plant Mol. Biol., 48: 251-275. Li TJ, Qiu BZ, Zhang XW, Wang LS 2011. Exogenous hydrogen peroxide can enhance tolerance of wheat seedlings to salt stress. Acta Physiolgia Plantarum, 33: 835-842. Lin CC, Kao CH 2001. Cell Wall Peroxidase Activity, Hydrogen Peroxide Level and NaCl-Inhibited Root Growth of Rice Seedlings. Plant Soil, 230: 135-143. Lu J, Li XN, Yang YL, Jia LY, You J, Wang WR 2013. Effect of Hydrogen Peroxide on Seedling Growth and Antioxidants in Two Wheat Cultivars. Biologia Plantarum, 57(3): 487-494. Monneveux P, Jing R, Misra SC 2012. Phenotyping for Drought Adaptation in Wheat Using Physiological Traits. Front Physiol., 3: 1-12. Öztürk İ, Avcı R 2014. 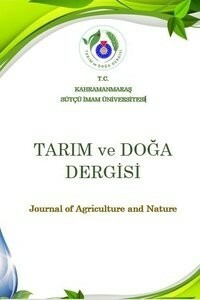 Ekmeklik Buğdayda (Triticum aestivum L.) Tane Verimi ile Bazı Tarımsal Karakterler Arası İlişkiler. Tarla Bitkileri Merkez Araştırma Enstitüsü Dergisi, 23(2): 49-55. Sairam RK, Saxena DC 2000. Oxidative Stress and Antioxidants in Wheat Genotypes: Possible Mechanism of Water Stress Tolerance. J. Agron. Crop. Sci., 184: 55-61. Sarwar AKM, Golam AKA, Masud RSMA 2013. Influence of Stomatal Characteristics on Yield and Yield Attributes of Rice. Journal of Bangladesh Agricultural University, 11(1): 47-52. Savvides A, Ali S, Tester M, Fotopoulos V 2016. Chemical priming of plants aganist multiple abiotic stresses: mission possible. Trends in Plants Science, 21(4): 329-340. Shahinnia F, Roy JL, Laborde B, Sznajder B, Kalambettu P, Mahjourimajd S, Tilbrook J, Fleury D 2016. Genetic Association of Stomatal Traits and Yield in Wheat Grown in Low Rainfall Environments. BMC Plant Biology,16:150-164. Ślesak I, Libik M, Karpinska B, Karpinski S, Miszalski Z 2007. The role of hydrogen peroxide in regulation of plant metabolism and cellular signalling in response to environmental stresses. Acta Biochimica Polonica, 54(1): 39-50. Song Y, Miao Y, Song CP 2014. Behind The Scenes: The Roles of Reactive Oxygen Species in Guard Cells. New Phytologist, 201: 1121-1140. Steel RGD, Torrie JH 1984. A Biometrical Approach 2nd Ed. McGraw Hill Book Co. Inc., Singapore. Steward FC 1963. Plant Physiology, Vol III: Inorganic Nutrition of Plants. Academic Press, New York and London. p 100. Uchida A, Jagendorf AAT, Hibino T, Takabe T, Takabe T 2002. Effects of hydrogen peroxide and nitric oxide on both salt and heat stress tolerance in rice. Plant Science, 163: 515-523. Valentovič P, Luxová M, Kolarovič L, Gašparíková O 2006. Effect of Osmotic Stress on Compatible Solutes Content, Membrane Stability and Water Relations in Two Maize Cultivars. Plant Soil Environ., 52(4): 186-191. Wahid A, Perveen M, Gelani S, Basra SMA 2007. Pretreatment of seed with H2O2 improves salt tolerance of wheat seedlings by alleviation of oxidative damage and expression of stress proteins. Journal of Plant Physiology, 164: 283-294. Xu Z, Zhou G 2008. Responses of Leaf Stomatal Density to Water Status and Its Relationship With Photosynthesis in A Grass. J. Exp. Bot., 59(12): 3317-3325. Zadoks JC, Chang TT, Konzak CF 1974. A Decimal Code for Growth Stages of Cereals. Weed Res., 14: 415-421.